I, along with 12 other students, joined the training session on Oct. 9, where we learned about the challenges faced by LGBTQ people, terminology pertaining to LGBTQ, and how to be supportive when speaking to someone either coming out as gay or transitioning to another gender. While I recognized definitions pertaining to sexual orientation, the terms used to describe gender identity were new and, admittedly, confusing to me. Nevertheless, the most important lesson I took away from safe zone training is the principle of being supportive of those who are treated as outcasts by society and, in worse cases, their families. Forty-two percent of LGBT youth say that their community is not accepting of them, according to the Human Rights Campaign. Compared to their peers, those who are LGBT are twice as likely to say they have been physically assaulted, kicked or shoved. Twenty-six percent of youth say their biggest problem is not feeling accepted by family, as well as trouble with bullying and being afraid to come out. Attending the safe zone training made me reflect on how I became more accepting of people who were different from me. Growing up, I never lived with anyone who identified as a part of the LGBTQ community. Some in my family looked upon it with disdain while others saw it as no big deal. The concept of being gay was constantly stigmatized in my middle school. The only time I heard the word “gay” being used was when my fellow classmates picked on their peers. Being picked on myself, I associated the word with something negative and, as a result, picked on other kids in the same way. This is the life of a child living in a sea of troubles. I matured out of that phase when I entered my high school years. It was there where I interacted with more people who flew the colors of the rainbow flag. I never learned about transgender issues until I came to college. I suppose that was the reason I attended the safe zone training, as well as mere curiosity. I also was curious how growing up as a Catholic brought me to be more accepting of those who are LGBTQ when Christianity is ironically used to discriminate against those in the community, too. The principle that I learned to follow was to love one another as we love ourselves. Homophobic and transphobic Christians are notorious for using the Bible to discriminate against the LGBTQ community, using passages like “You shall not lie with a male as with a woman; it is an abomination” and “they shall surely be put to death.” While I haven’t examined it myself, it didn’t take me long to know it is teeming with contradictions. This is possibly due to numerous translation differences. When thinking about homosexuality, I often think of a discussion I had with my mother. We were driving at night listening to George Michael on the radio, who at the time had recently died. While listening, she suddenly started talking about how Michael was gay, yet people like him are still treated with contempt by those on the right. I was speechless for the rest of the car ride. The impact of that conversation made me grow to accept people for who they are and the safe zone training I attended taught me to be supportive of people who are different from me. Mistakes and slip-ups are inevitable, but working to show genuine appreciation of people, regardless of their identity, is what I can do to become a better person. 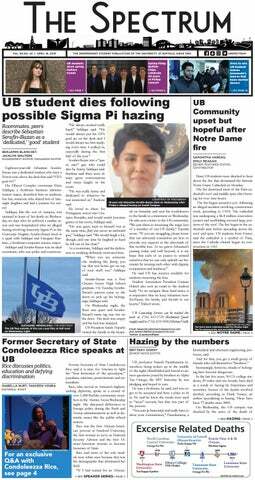 Cian Gonzalez is a staff writer and can be reached at news@ubspectrum.com.